With half the season over and a short break in games for Christmas, it seems like a good time to look at the impact the new Eastern Counties Leagues have had since they were implemented in September, as well as a look at what is happening in the London and National leagues as far as local clubs are concerned. The first three weeks of the revamped leagues saw some one-sided games, some call-offs and some concerns that teams had been entered that were never going to actually turn out. There was some very harsh criticism of Colchester II being placed in EC2 South when their first three games saw them score over 300 points (see How do you solve a problem like Colchester?). Although they remain unbeaten after nine games, two of their wins being walkovers, the club has sensibly fielded their 3rd XV where possible and opposition teams have accepted that they will be in for a tough time when they play Colchester and as a result games have generally been played in good spirit. This has been helped by the fact that the rest of the teams in this league are pretty well matched with not too many big scores being posted, and it is a similar story in most of the other eight leagues. The scaremongering from some quarters that teams being defeated heavily week after week would see players leave the game does not seem to have been justified. More of a worry is the number of call offs at the lowest levels. In EC4 North there has not been a single week when there hasn’t been at least one call off with three or four games regularly being cancelled each Saturday. Much of it is down to two or three clubs being overambitious in entering an extra team expecting players to be available but they never materialised. The same is true to a lesser extent in EC4 South but in EC4 West there have been few cancellations so that must be seen as a success. Which brings me on to call-offs higher up the leagues in Eastern Counties 2 and 3. It is one thing to not play a game because the team doesn’t actually exist, but there are a disappointing number of games called off on a Thursday or a Friday because a team doesn’t have enough players. But how many is too few? How many players do you need to have a game of rugby? If your team is playing away and you only have 10 players available and the home team has 16, is it so bad to play 13-a-side? Is that not better than not playing at all? Surely even a 10-a-side game is preferable to spending the afternoon at home or shopping with the wife or girlfriend. Team captains need to contact each other by the Thursday to check how many players they have available between them, and rather than worry about league points, concentrate on how they will get a game of rugby played on Saturday. I must give particular praise to March Bears and Wisbech II who, despite being on the Western edge of our area, have honoured nearly all of their away fixtures, travelling short if necessary, and in the case of Wisbech going as far as Gt Yarmouth. On my travels to clubs I always ask them how the new leagues are working out for them and the general reaction is favourable. Travelling distances are shorter for most teams (those mentioned above being notable exceptions) and more competitive games are being played. Promotion for second teams as far as Eastern Counties One is seen as a positive but they are not yet allowed to progress to the London Leagues. The RFU’s Adult Competitions Review is looking at how to provide a competitive league structure for second teams of clubs playing in the National and Regional leagues so we’ll see if they manage to come up with a workable model. Next season should see more competitive fixtures in the Eastern Counties Leagues as the strong teams get promoted and those struggling are relegated. Colchester’s 2nd, 3rd and 4th teams should all move up along with other teams dominating their leagues such as Swaffham II in EC4 North and Ely Development in EC3 West. The other leagues have two or more teams in contention and hopefully that will continue to the end of the season. Southwold have had a tremendous year in EC1 and are looking good to win promotion to the London Leagues for the first time in their history, with Ely likely to be contesting a play-off to join them. Eastern Counties teams are doing very well in the London Leagues. Sudbury are unbeaten in London 3 and are favourites to go up with Cantabs, West Norfolk and Lowestoft & Yarmouth battling it out for the second automatic promotion place. London 2 is very close with just six points separating the top five sides which include Diss and Saffron Walden, but whoever is promoted will be aware that last season’s runaway winners Ipswich have found life very tough in London One with just two wins to their name so far. The Suffolk side will do well to avoid the drop. At the other end of London One it is all about Colchester and Eton Manor who are streets ahead of the rest. Who is promoted and who goes into the play-off may possibly not be decided until they play each other in the last game of the season in April. 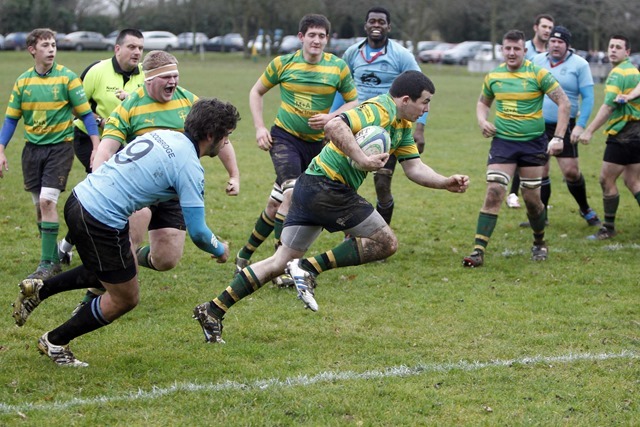 The three local teams in the National Leagues are having mixed fortunes. Bury St Edmunds are in the mix for promotion and were briefly top of National 3 until three defeats in four games before Christmas put a dent in their ambitions, although they remain just five points behind the leaders. If they do go up it is possible that they will change places with Shelford who are facing a scrap for survival unless they can put a few wins together. Meanwhile close neighbours Cambridge sit comfortably mid-table. Let’s see what the New Year holds but the important thing is that games are played, players get onto the park and that they enjoy their rugby.